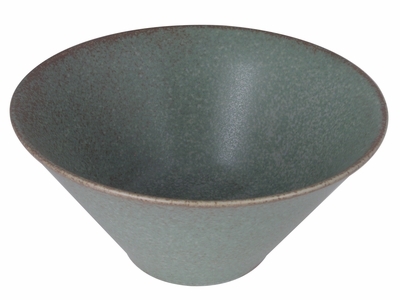 Perfect for serving main courses, salads, bread, or pasta dishes, this unique large dinner serving bowl features speckled colors of light and dark pale greens along with blotches of brown. For those with a big appetite, this Japanese noodle bowl can also be great for busy noodle soups like ramen and pho. With several tones similar to the colors found in Spanish moss on a smooth paper like texture, this simple yet elegant design will add the charm of nature to your dining table. As each large dinner serving bowl is carefully hand crafted, no two serving bowls will ever look alike, just like the unique colors of plants in nature. Made in Japan from quality ceramic, this large dinner serving bowl comes packaged in a paper box, making it the perfect gift idea for housewarming parties. Surprise your friends and family and invite them over to dinner, serving all kinds of food inside of this tall Asian serving bowl and complete your dinner table with the rest of the Green Moss collection.